Electronic data interchange (EDI) was the standard for exchanging business transactions, purchase orders, invoices, shipping notices, and electronic funds transfers for over 25 years. In the last 10 years, EDI evolved with newer technology, especially with the ubiquity of the Internet. Because of these technological advancements, EDI is nearly as easy to use as email and is no longer an option for doing business. Instead, EDI is a business requirement. One of the major concerns of IT and business decision makers responsible for managing supply chains and the activities of their trading partners is how to enable more effective collaboration with business partners that have individual regulatory requirements. The varying degrees of technical expertise, communications protocols, data standards, and information systems of those business partners also are of concern. Adding to this complexity is the short supply of EDI or business-to-business (B2B) process expertise and the technologies required to achieve successful B2B collaboration. This shortage is even more difficult to overcome as most businesses search for administrative savings and vital performance improvements. Businesses also are trying to keep pace with the growing demand for accommodating new global partners, automating more interactions, and managing older EDI systems. Adding to this difficulty is the growing number of data types, standards, and protocols. Organizations need a secure, agile, flexible, and global B2B integration platform to respond to these challenges. When combined with real-time business process visibility to achieve the highest level of B2B collaboration, the EDI platform can accommodate resource limitations with a skilled, experienced staff to offload the responsibilities from your own IT personnel. These responsibilities include bringing on new partners to managing your entire EDI and B2B operations. IBM® B2B Cloud Services delivers the technology, expertise, and range of Cloud solutions to address your global B2B needs. 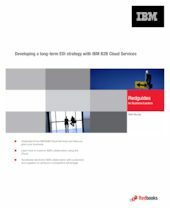 This IBM Redguide® publication is for IT and business decision makers to help them understand how IBM B2B Cloud Services can meet their global B2B needs.